130/365(+1), a photo by Luca Rossini on Flickr. Our new place is a two-storied flat. Eight and ninth floor. The eight floor is dedicated to rossiniphotography and to the bedrooms. The entrance is directly in the photographic studio, with the lab directly connected to the place. The bedrooms are beyond a corridor, separated by a door from the studio. The ninth floor is dedicated to the social life, it’s an open space where living-room, dining-room and kitchen all find place, and all face the roof terrace. So, we enjoy our time upstairs and work and sleep downstairs. 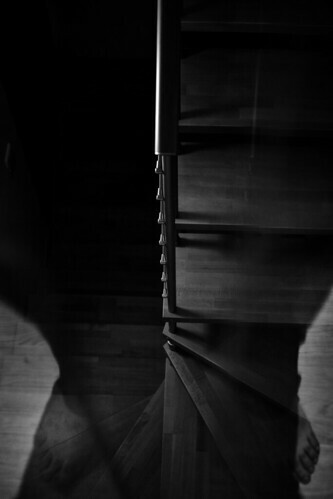 The staircase is the physical interconnection between these two worlds. We have decided for a wood and metal self-supported staircase, and we had a glass-wall installed on the ninth floor to prevents us from falling down. So, if you walk close to the glass wall and look downstairs, you have the three levels, the eight floor, the ninth floor, and the staircase, all somehow connected in a sort of fusion of wood and shadows. This is the only place in the house where I can stand on all the three levels, in all the three worlds, at the same time. Between work, leisure, and sleep. That sounds amazing! I'm jealous of that layout … I love the idea of an entertainment floor, including roof terrace with hot tub. You've got it made man! Sorted man, we'll be there one day as I HAVE to come back to Rome! Next time I return I want to live less like a tourist and more like a Roman!